If you’re in the mood for some hearty ground beef BBQ enchiladas, then this recipe is for you! Many great flavors come together in this dish to complement the ground beef and BBQ sauce, including refried beans, diced chilis, fire roasted crushed tomatoes, extra sharp cheddar, and Monterey Jack. It’s the perfect dish when you’re looking for some comfort food. Be sure to share the recipe with friends and family on Facebook, Pinterest, Instagram, and Twitter. Preheat your oven to 375°F and divide one can of the fire roasted crushed tomatoes between two 9x12 baking dishes, spreading the tomatoes to cover the bottom of both dishes. Next, brown the ground beef with the chopped onions and minced garlic and discard any excess grease from the pan. Stir the chili powder, cumin, and coriander into the beef mixture and cook for about 1 minute. Remove from heat and stir in the second can of fire roasted crushed tomatoes, one can of the chilis, the refried beans, and BBQ sauce. Mix well and set aside. 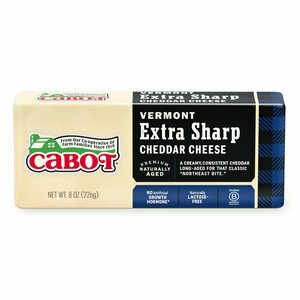 In a large bowl, mix together the grated Cabot Extra Sharp Cheddar and the grated Cabot Monterey Jack. Spread each tortilla with about &frac13; cup of the beef filling mixture. Then add ¼ cup of the combined shredded cheese on top. Roll the tortillas tightly and place in a row in the center of the prepared baking dishes, placing 10 tortillas in each pan. Repeat until you’ve used all the tortillas and filling mixture. Pour the remaining can of crushed tomatoes and the remaining can of chilis over the tops of the enchiladas. Sprinkle the chopped cilantro and the remaining cheese evenly over both dishes. Bake for 20 to 25 minutes or until heated through. Serve with Cabot Sour Cream and a sprinkle of cilantro. When you want some tasty chicken enchiladas, be sure to make these Cheesy Chicken Enchiladas! 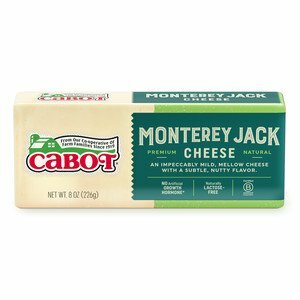 Did you know that Cabot is a co-operative of over 800 farm families who all work diligently to produce only the highest quality products? 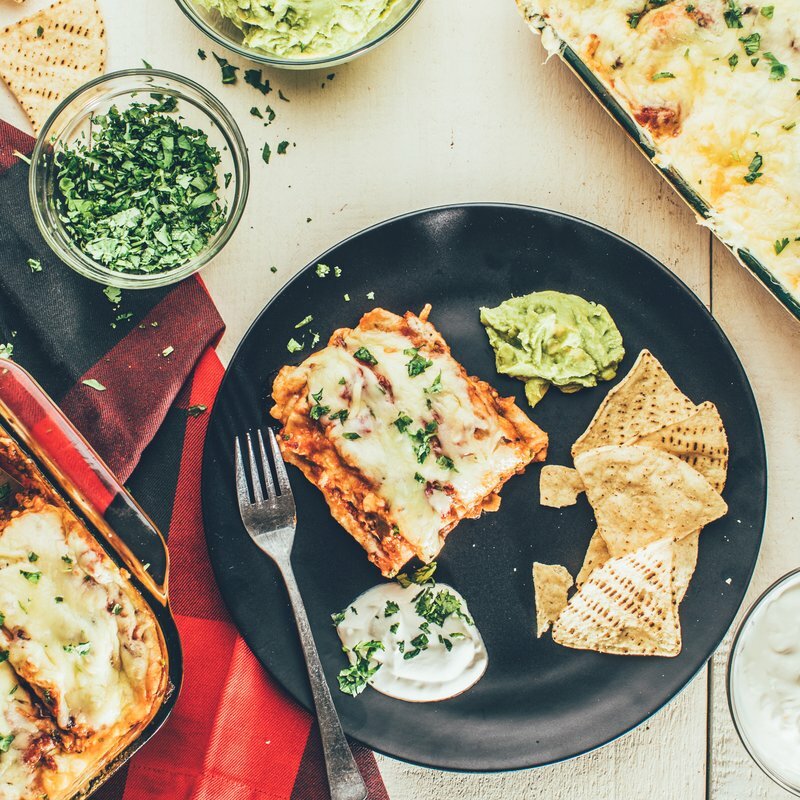 We’d love for you to share your thoughts about these BBQ enchiladas so, if you could rate and review the recipe once you’ve given it a try, we’d really appreciate it! PREHEAT oven to 375°F. Divide one can of the tomatoes between two 9x12 baking dishes and spread the tomatoes to cover the bottom of the dishes. BROWN the ground beef with onions and garlic. Discard any excess grease from the pan. Stir the spices into the beef mixture and cook for 1 minute. Remove from the heat and stir in one can of fire roasted crushed tomatoes, one can of the chilis, the refried beans and BBQ sauce. Mix well and set the mixture aside. MIX together the 2 varieties of cheese in a large bowl and set aside. SPREAD each tortilla with about &frac13; cup of beef filling mixture. Add ¼ cup of combined shredded cheese on top. Roll tortillas tightly and place in a row in the center of prepared baking dish. Repeat the process until you’ve used all of the tortillas & filling mixture (ten tortillas per pan). POUR the remaining can of the crushed tomatoes and chilis over the tops of the enchiladas. Sprinkle the chopped cilantro evenly over both dishes. Sprinkle the remaining cheese evenly over both dishes to cover. BAKE for 20 to 25 minutes or until heated through. 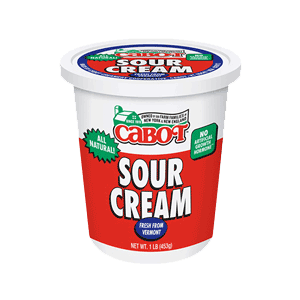 Serve with a dollop of Cabot Sour Cream and sprinkle of cilantro if desired. Recipe courtesy of Ed Townley, Cabot Creamery Co-operative's President and CEO.